But here’s where Geoff’s analogy blew me away. Traditional worship music has an endoskeleton, or its skeleton on the inside. Like an elephant – the rhythm is inside. Everything it needs is contained inside the very melody. But modern worship music has an exoskeleton, or its skeleton on the outside. Like a crab – the instruments both complete and support the melody. It’s why the instrumental part of the music plays such a huge role in modern worship music and why it needs to be prominent to work. Think about how a hymn can just about sing itself, with no accompaniment. We often sing them acappella – and they work great! In fact, it’s easy to mess up the hymn by trying to play along with it – can I get a witness from a guitar player?! But now imagine singing “Your Grace Is Enough” acappella. Too hard to imagine? Here…listen to this. 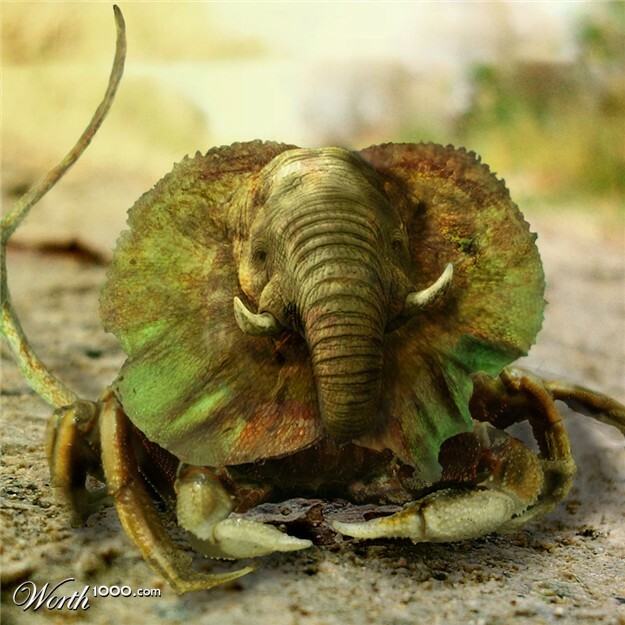 Now imagine what a crab disguised as an elephant would look like. I broke the Internet looking for one. This is what we do to many songs. It certainly looks neither like a crab nor an elephant! Have you ever heard (or played) a song that didn’t seem to be the same song as what you heard in the recording? Let me translate this. If you’re playing a hymn, make sure that you don’t get in the way of the rhythm or create a competing rhythm. If you’re playing a modern song, make sure you’re playing the music appropriately. If rhythm is the exoskeleton that modern music needs, burying the rhythm behind the piano and guitar (or having the piano and guitar not playing to the bass and drums) would be like a floppy crab with no skeleton (read: a dead crab!) So if you’re doing modern worship music, the rhythm is paramount. If you have drums, the drums should lead. Shocking? Perhaps. But that’s how this music works. It has an exoskeleton. Now here’s where it gets really messy. Hymns have everything notated for you…notes, measures, performance indicators. The music is literally all there for the piano or organ to plunk out while we sing the same notes. Most worship teams play modern music from a chord chart that has…no notes, no measures, no performance indicators. Now, you can get the orchestration for many songs from services like PraiseCharts.com, but how many of your team members would be able to read them? So rather than reading music, most of us have to learn a new skill: decoding recordings and taking those ideas as a starting point for how our team will actually play the song. The listening part is called “listening in tracks.” For example, a drummer will listen to Your Grace Is Enough and note that the kick drum is played on every quarter note of the song (except for the “down” prechorus and chorus) and the hi-hat, which is closed for the verses, opens up for the chorus. The drummer will also notice how the drums set up each new section of the song. Then the team will need to decide if they’ll play the standard recording’s full-energy intro or some other way that’s more fitting to your context. And there’s learning in this for sound techs as well. Should the piano or guitar really be louder than the drums and bass if the drums and bass are the exoskeleton? No. I should notice the crab’s shell first, not it’s guts! Read more here. If this is frustrating to you and you’re saying “I can’t do this, so I guess I can’t play modern worship” I feel you! It may even be helpful to have an Ad Lib Music Coach come to your rehearsal to teach this to your team! Click here for details.